I’ll be honest – I’ve loved almost every TED talk that I’ve watched. The topics are varied and interesting and beautifully expressed. They are fertile ground for a girl hunting ten dollar thoughts. So it’s a bit surprising that it’s taken me two months to finally watch Sheryl Sandberg’s TED talk from December. It’s been recommended to me by friends and bloggers alike, and now that I’ve finally watched it I can see what all the fuss is about. As the COO of Facebook – by way of the US Treasury Department and Google – Ms. Sandberg knows a thing or two about playing in the boys’ sandbox. So her thoughts on the topic of female business leaders are well founded. In her talk (which is well worth 15 minutes of your time and can be found here) she cites one after another statistic about how underrepresented women are within the ranks of business and political leadership. Listening to her litany of stats made me sad. Yet even as I listened I didn’t find myself jumping up to volunteer for the sacrifices I’d almost surely have to make to reach her professional heights. In her talk Ms. Sandberg highlights three steps that she believes working women should take to guard against our scant numbers in the leadership positions in this country. They are worthwhile recommendations. They are pieces of advice that I intend to heed as I move forward in my own career. But still I wonder if they are enough. If I’m being truthful, I’ll admit that Sheryl Sandberg freaks me out a bit. Her life and career challenge much of what I believe about my own career. But what if I’m wrong? What if a more challenging, demanding, and rewarding career would be good for me and my family? What if the gut-wrenching sacrifices I envision really wouldn’t be all that bad? I don’t have the answers. And while Ms. Sandberg claims at the start of her TED talk that she doesn’t either, her body of work implies otherwise. But listening to her speak about the absence of women in leadership roles caused me a not insignificant amount of self-doubt. Am I chicken? Am I playing it safe because society embraces that decision? Am I being governed by fear? These questions continue to swirl in my head. I know I am smart. I know I am energetic. I know that I have goals and ideas and initiative. What I don’t know, however, is how to synthesize these things into something significant; something about which I am passionate and of which I can be proud. I will let these questions continue to swirl. I will probably watch Ms. Sandberg’s talk a few more times. And perhaps before too long I’ll summon the gumption to do something big. PS – Many thanks to my genius sister-in-law and blog designer, JPG, for TDT’s new graphics. There will be a few further enhancements rolling out in the next couple of weeks, but the bulk of our redesign work is here. JPG, you are smart, collaborative, creative, supportive, flexible, inspiring, stylish, and fun. Working with you is a joy and I’m so grateful to have your support with this blog. Thank you! This entry was posted on Friday, February 4th, 2011 at 5:00 am	and is filed under Choices, Culture, Inspiration. You can follow any responses to this entry through the RSS 2.0 feed. Both comments and pings are currently closed. So much of this resonates with me, Gail. I sidelined myself before I even started, in some ways, by taking an “alternative” job when I graduated from business school, one that would afford a flexible schedule once I had kids. I have that, and I’ve been able to work part-time and flexibly (mostly) since having my kids, and I have a husband with a demanding job, so it works. (that btw is another topic: that women like Sheryl often choose spouses in similarly demanding professional roles, which doubles the pressures on a family). But I do wonder what would be if I had thrown myself more fully into the business world – what I’d have been able to achieve, what I’d have WANTED to achieve. Anyway, I don’t have answers – but thanks for the immensely thought-provoking questions. Lindsey – Your comment here is spot on. One of the three pieces of advice that Sandberg gives is “Don’t leave before you leave.” By this she means that many women do just what you did – back down from promotions and challenges before they have children. This makes our jobs less fulfilling and we are then more inclined to walk away from them after we have kids. Whereas, if we’d “kept our foot on the gas pedal” (as she calls it) up until delivery we might had more to go back to after maternity leave. You’re right. The answers are not easy or readily available. But I still must ask the questions. Thanks for your perspective here, as always. What a great website! I never knew it existed until you – so thank you for that. And the challenges and others’ drive/success/ambition when compared to our own? I struggle with this every day since I’ve chosen a career as mother. Every. Single. Day. As the sole male voice here (at least for the moment) let me say that some of these decisions are very hard for us too. I turned down opportunities and didn’t chase some because of my concern for my family. It isn’t now and it wasn’t easy then. I have a dear friend who has been making an enormous amount of money for years now. He will probably be able to retire by the time he is 52. That is ten years from now. And because of his efforts his family lives a very nice life, but much of it is without him. I decided not to do some of those things because I wanted to experience more with my children when they were younger. But there are sacrifices there too. Jack – Thank you so much for chiming in. I always love getting a man’s perspective on these things. You are quite right in that not every man chooses the fast track. And many men struggle with the repurcussions of their decisions either way. I wonder if men face the inverse problem that women do. That is, women are often judged if they commit to a high-powered career. So are men judged if they dial down their careers (read: title, salary, reputation…) in the interest of more family time? I suspect the answer is Yes. I haven’t listened yet, but I’ll try to find the time. As a professional working woman, I’ve often felt stymied economically. I would need to work hard long hours, likely traveling to some degree, to get ahead. Unfortunately, at my current position, the pay is insufficient to afford the quality after-school care needed to work those hours and feel comfortable doing so. I currently am facing this exact decision – take a more demanding job with much high potential knowing I’d have to find reliable, quality childcare, or continue with my existing role, limited in potential, but much more flexible. I haven’t had the best of luck finding good, reliable childcare so I am hesitant. However, it could be that I am just being cheap and so cannot lure the better talent. My kids are getting older now so I am feeling a little more free….and college tuition is just around the corner so a pay hike might be welcoming too. I’m not naive enough to believe that the path I chose is right for everyone; however, I struggle to feel there is any job “more” important than that of a stay-at-home mother. Through several of the above comments I sense that somehow those who chose “lesser jobs” so they could have more time with their kids question that decision. To the man who chose the job that takes him away from home more now with the knowledge that he can retire at 52, I would caution that at that point the kids are either gone or are somewhat lost to him because he’s been gone. Is there anything more important than helping raise future citizens that will contribute to the happiness and well-being of the world? I am sure I’m looking at boardroom positions with a somewhat prejudiced view, but in line with questioning the “American dream for financial success” and questioning whether bigger is better when looking at our homes, a part of the boardroom position equates to greater financial success. While that position may bring greater personal growth than playing pat-a-cake or hide-and-seek, the personal sacrifice the adult makes reaps benefits you cannot possibly imagine. I guess maybe I’m saying if the boardroom is a goal, go for it later in life and make the current job of child-rearing the priority. To Ms Sandberg’s litany of stats about the underrepresentation of women in business rankings and political leadership, I say bravo! Women are making choices that work for them and their children. I know there are men and women who are better parents if they are also successfully employed in the job market…just be careful that you don’t allow the job to become more important than family……because quite honestly, after 166 years of child-rearing (that’s 6 kids times the years they’ve been here) I understand the sacrifice and more importantly the incredible benefit of parenting being my most important job. E – You make some really fair points. And you’ve struck straight to the heart of aspects of my struggle on this topic. I’ve highlighted in previous posts the cultural pressures to pursue financial success and the trappings thereof. Is this topic just more of the same? Do I struggle with this because I feel I’m “supposed” to want a “bigger” career per our cultural norms? I don’t know. But the decision for a young mother (who doesn’t have to) to continue working is a big one. And so I feel it warrants the tough questions. I think my response to Aidan’s comment best articulates my conundrum. Is my ambivalence a function of societal pressures? Or do I have goals and dreams that I’m squelching just because it’s easier as a mother to tread the soft, well-worn professional path of middle management? For those whose dreams are to raise a family, undistracted by a career, I applaud their decision. I agree with you that the full-time mom is a breed apart. And I am thankful that we live in a time and place that affords them that choice. As for me, if I’m being truly honest with myself, I have no interest in a career like Ms. Sandberg’s. I would be miserable. But her example prompts me to question what it is that I do want. I do want to be an active part of my children’s lives. I do want to be there for school plays and sports games and supper each night. However, I don’t want to wholly sacrifice my own goals and passions in the process. I want to set the example for my children of pursuing my own dreams and interests. While I suspect that there will eventually come a time when I step away from the workforce for a while, I don’t think I would be happy as a stay-at-home-mom in the long term. And so if I were to choose that path I believe it would negatively impact my mothering. I must contemplate the true nature of my goals, and then determine how best to pursue them without interrupting my job as a mother. I don’t yet know exactly what my goals are. And I don’t yet know how I’ll achieve them. But I know that I won’t begin to come close if I’m not willing to ask these questions that make me a bit uncomfortable. Gail, the statistics are indeed depressing, particularly when you consider that women currently receive 57% of bachelor’s degrees and comprise 60% of graduate enrollment. Much of it IS based on the choices we make. But for women, it’s often framed as a choice whether to make sacrifices for your career vs. a family, and I really think that has little to do with it. It’s whether the sacrifices you make for your career are worth the resulting career. The problem is that we all (women) know the statistics and we experience the work environment every day. You can be smart, energetic, and have goals, ideas and initiative and still not make it. Why? Because you’re not a guy. Maybe because you don’t think you aced the class you never went to or tell everyone that you’re awesome or whatever it is that guys do, that women don’t. The fact is that the workplace rewards men for being men or doing what men do (either because it is natural or because it’s what they’ve been trained to do by society). So flat out, it’s easier for men. It’s a system that was set up by men a long time ago and it’s still controlled by men. It’s not intentional and it’s not overt, which makes it harder to notice and harder to change. You don’t realize for a long time that you are swimming in the same direction as your male counterpart but the current is with him and against you. Most women won’t make the same sacrifices as men to be successful, they will make more. As Sheryl Sandberg points out, you want what you do to be rewarding. But is career success rewarding for women? It could be, but I would suggest that for many women it’s NOT particularly rewarding and that is why they “drop out.” Who wants to fight extra hard against the odds to be successful so that people will ultimately like you less (the Howard vs. Heidi example)? You can make it into the club if you put up a huge effort, but you may never really be a member. I think for many women, the ROI doesn’t make sense – career “success” isn’t or doesn’t seem worth the effort. They leave, decide to coast, or focus more their family when they get tired of the fight. The same scenario plays out for minorities with the same result, which is why the statistics never improve. Amy – Thank you so much for this response. I really appreciate your insights. I agree that the career has to be worth the sacrifices, and the fact that it frequently isn’t is why so many women leave the workforce. I wonder if, in some hypothetical scenario, men and women were rewarded equally for their talents and efforts, what the workplace demographics (especially at the executive level) would look like. Early in our professional lives it’s easier to accept careers that are less than spectacularly rewarding because we’re young and inexperienced and we understand that we have to pay our dues. But when we get into our thirties and we’re looking at the tradeoffs we’ll have to make as parents we set the professional bar much higher, as we should. One thing that this discussion has prompted me to think about is that most women have interests and goals and those don’t go away if/when they drop out of the workforce. So what are women doing to pursue those interests outside of a career? I don’t have a problem with anyone becoming a SAHM, but I think an important part of it is demonstrating to our children that we are people (with likes and interests and hobbies and goals) separate from our role as a parent. Thanks again for reading and for this thought-provoking comment. Fresh out of college, I chose a career as a middle school music teacher. One that has challenges that any stranger on the street will acknowledge with that phrase I’ve heard far too often “Wow! It takes a special person to teach middle school…” I chose that career because of my love for children and jumped whole-heartedly at the opportunity to challenge myself every day with those emotional, hormonal, “weird” kids whom I found to be incredibly earnest, willing to learn and hilarious. My big brother has always been very verbal about how highly he values teachers and their contributions to society. I chose that career knowing full well that my life long career was to be a stay at home mom. No where in this discussion has that choice of staying at home with children been acknowledged as a career… Stay at home moms work 24 hours a day, 7 days a week, 52 weeks a year. No sick days, no vacation days, no substitute to step in while I sit back and relax, or read a book, or even shower! I’m not looking for sympathy at all – I LOVE my job and all of the challenges and rewards it brings to my life. The career of staying at home offers just as many challenges, goals and venues to better oneself, while being a positive role model for those little people you brought into the world. My best friend said to me after she had her first child, “I am a better mother when I work, even part time.” I absolutely respect a woman’s decision to work (or need to work) after having children. I never dreamed of my wedding day, I dreamed of being a mom, so I recognize that my passion and opinions on this career choice are pretty strong. I do not feel as though I have to defend my choice because I believe in it that much. Forget whether it is society imposed or self imposed! I guess I just get a little tired of the discussion always being about choosing the best job, how much money you can make, buying the best house, wearing the most expensive clothes…Why isn’t it more about the kind of person you choose to be every day and the kind of person you raise your child to be? If I could have uploaded a picture of my boardroom, I would have. I, however, was unable to, so I’d like instead to describe it to you. My boardroom is a place where creative thinking and play is not only encouraged, it is sought after. Like most boardrooms, there are times when positive energy and emotions fill the room but there are also times ideas or actions are not met warmly. Of the four walls, three are kiwi green and one is black. The black wall happens to be chalkboard paint where anyone and everyone is free to write their ideas throughout the day. Currently it is covered with bubble letter names of my kids and their cousins provided by Aunt J and the artistic doodles of a two-year-old. The doodles consist of circles, dogs, Mommy and Daddy, none of which you would have been able to make out if that adorable two-year-old hadn’t told you what they were. Some other notes that have made it to the wall include the alphabet, many other shapes, an outline of our newest baby turned two-year-old and E’s famous lion. 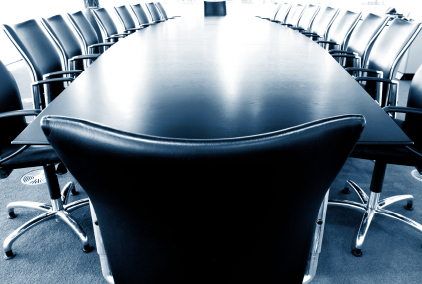 Unlike most boardrooms, there is not a table with enough chairs for all the participants of the upcoming meeting. Instead, there is an activity table, a piano, stuffed animals, puppets, balls, books, puzzles, trucks, blocks, a roller coaster, an elephant that shoots butterflies through his nose that you then try to catch in your butterfly net, Legos, big foam climbing blocks, etc. When the moment strikes my colleagues and me, my boardroom turns into a club, and let me tell you, my colleagues have some pretty slick dance moves! Just about anything you could want for a child to develop physically and intellectually can be found in my boardroom. While discussing this post with my husband tonight, he officially made me CEO of our household and himself the CFO. Another part of our discussion included me expressing my dislike of the world “sacrifice” that continues to be used because I hate how negative it sounds. At this point my darling husband reminded me that “sacrifice” shouldn’t necessarily be seen as negative because after all, isn’t sacrificing your life to save someone else a good thing. I still can’t quite shake it though. The moment you make any big decision in life, life as you knew it and may have envisioned it going will change. I’m not critical of others’ wants or needs to reach their own boardroom. I just wanted to describe mine and let you know that at least this one female has made it to her boardroom……and I love it. Gale, I thought I’d respond to your comment on my blog post (same topic) here. Amazing how there are so many aspects to her talk, more than we can even count! This part of your post really jumped out at me: “If I’m being truthful, I’ll admit that Sheryl Sandberg freaks me out a bit. Her life and career challenge much of what I believe about my own career.” Here’s my take on that, because I COMPLETELY understand where you’re coming from, and I don’t even have kids yet. THERE ARE ALWAYS CHOICES, between work and personal life, and it can be damn hard to find that balance. Sure, you can wonder if Sheryl Sandberg has it all and really is able to be a ridiculously successful COO (of Facebook, no less!) while having a family and a strong marriage, getting paid loads of money and also managing to be fashionable and throw dinner parties (I read in a Vogue interview that her outfits at those dinner parties come straight off the runways). But here’s the thing: she doesn’t have it “all.” She can’t. It’s just not possible. I don’t know her, so I guess I can’t really say that. But she IS making sacrifices, sacrifices that are worth it to her. Does she sit and wonder sometimes if she’s made a mistake, missing out on soccer games and reading her child a bedtime story? I bet you she does. If she could trade her life with that of a stay at home mom (an equally difficult – if not more! – job) would she find her life just as gratifying, or gratifying in other ways? Yes. So… I guess I’m saying don’t let her freak you out. If I take anything from her talk, it’s that we need to fight to make sure that the opportunities are there for the women who CHOOSE to have a career like hers (not that all will, or should). Lori – Thank you for this passionate response. You are right. Motherhood can be as engaging and challenging as we want it to be. We can answer the question, “Mommy, what are clouds?” with an effortless and off-hand response. Or we can engage with our children, helping them explore and helping both ourselves and our kids find fulfillment in the conversation. We can incorporate many of our passions – be they music, reading, theatre, cooking, math, history, sports, or art – into our parenting, building a family culture that reflects our values and imparts it on our children. And we can do this while simultaneously cultivating ourselves. You are absolutely right about that. When I make the distinction about career vs. parenthood I absolutely do not mean to imply that full-time parenthood isn’t work. Nor do I mean to imply that it isn’t a vocation or a choice. The reason for the distinction is that when we discuss this working mom vs. SAHM debate one of the biggest aspects of it (apart from financial requirements for families who need the income) is, does the career warrant the time away from the kids? In your case, your dream was to have kids, so you are fulfilling your dream with your life as a SAHM. For me, I always knew that I wanted to have kids (and I love my role as a mother), but it wasn’t my central goal. I also dreamed of having a career outside the home. As an example, I love writing and would love, at some point, to make it a bigger part of my life. But by its definition writing is a solitary activity and one that certainly doesn’t lend itself to being worked into a day at home with young kids. So in order for me to pursue this dream I have to find time away from my son in order for it to be successful or rewarding in any way. So, how do I continue to write and focus on my family? I have to ensure that the time spent writing (or anything else) is worth the time away from my son. The purpose of this post was never to imply that full-time parenthood can’t be fantastically rewarding or fulfilling. Nor was it to imply that those who choose it have in any way settled for less. (It drives me crazy when women talk about full-time parenthood and say, “It’s just not enough for me.”) What I meant to say is that some women have interests in addition to their passions as parents that can’t be fulfilled within the realm of parenthood. For those of us for whom that is true, we are faced with a tough decision about which interests are worth cultivating after we have kids and which are not. None of this is easy. We all have to make the right decisions for ourselves and hope that everyone else does the same. Lori – After I posted my previous response I had one more thought. I would never have been satisfied in a life without children. I want to be a mother. Going through life without children would have left a big part of me feeling unfulfilled – like there was something else I was supposed to be doing, but wasn’t. This is also how I feel about my career outside the home. In the same way that my role as a mother is a big part of me that I’m unwilling to forego, so is my professional life. Ultimately my family is more important, for sure. But in a world that allows for shades of grey (I give up some time with my son in order to have a career, and I give up some of my career potential in order to be a mother), I will try to find the middle ground. What got under my skin about Sheryl Sandberg’s TED talk is that in looking at her life we don’t see evidence of those tradeoffs. As Rebecca aptly pointed out in her comment, just because we don’t see her tradeoffs doesn’t mean they aren’t there. That was an important reminder for me. Lindsey (#2) – I love your description of your boardroom! It clearly suits you and your board members. CEO of the household is such an appropriate description for SAHMs. You plan, organize, implement, problem-solve, and so on. And you are a wonderful example of how full time motherhood can be as rewarding as you want it to be and as fulfilling as you make it. I know many women like you and I am always impressed by their energy, creativity, flexibility, and commitment to their role as mothers. Indeed it is important that we all have the opportunity to choose what our boardroom looks like, whether it’s a conference room, a classroom, a home office, or a playroom filled to the brim. Thanks for bringing this perspective. I think I knew, at some level, that Sheryl Sandberg has faced the same tradeoffs that every working parent faces. As I mentioned to Lori, there is no surface level evidence of them, but that doesn’t mean they aren’t there. I needed that reminder. I don’t know what her relationship with her children is like. I don’t know what her relationship with her husband is like. I don’t know if she has intimate and satisfying friendships. I know that she has a killer resume and gorgeous hair. But what I can see in 15 minutes on a stage leaves much to the imagination. For all the mental gymnastics her talk has caused me to do, the net result of it is a positive one. I have thought critically about my career, what it means to me, what I need from it, and what I am willing to sacrifice as a parent on its behalf. What matters most is that I ask these hard questions, think about them carefully, weigh my decisions thoughtfully, and arrive at a balance that works for me, my husband, and my kids. Whether my end result looks anything like hers is utterly irrelevant – no matter how great her hair is! Gale, well said! I completely agree. I was talking to someone else recently who said that her friend works SO hard, that between her career and being a mom, she has absolutely no time for exercise or friends. Well, you know what? Those things are important – to me, at least! Sure, there are times in your life where some things have to give. But I would not want a life where I never had the time to go to yoga or chill with my girl friends (both of which are activities that are very important, health-wise… one physically, one mentally). I am not judging her choice! But it’s just that -a choice. And it’s good for all of us to remember that the people we look at and admire or envy have struggles, just as we do.